Offset ENVELOPE 9.5"X4.125" on 70lb Premium Uncoated Text Full Color. Offset envelopes are printed flat on offset presses, then die cut and converted into envelopes. 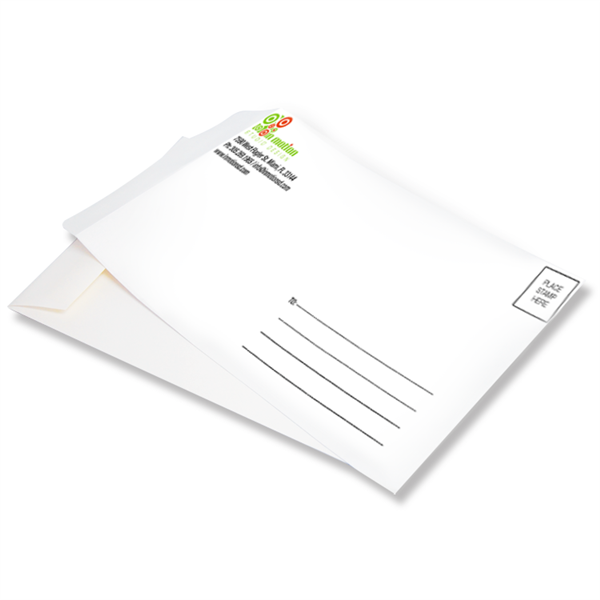 Envelopes are simply essential for all households and offices, regardless of personal details or preferences. Whether you are mailing invoices or personal letters, be sure you always have a sized envelope or two or more on hand for any office or home need. At www.INMOTIONSD.com, we focus on providing our customers with the largest variety of envelopes sizes, styles and colors. 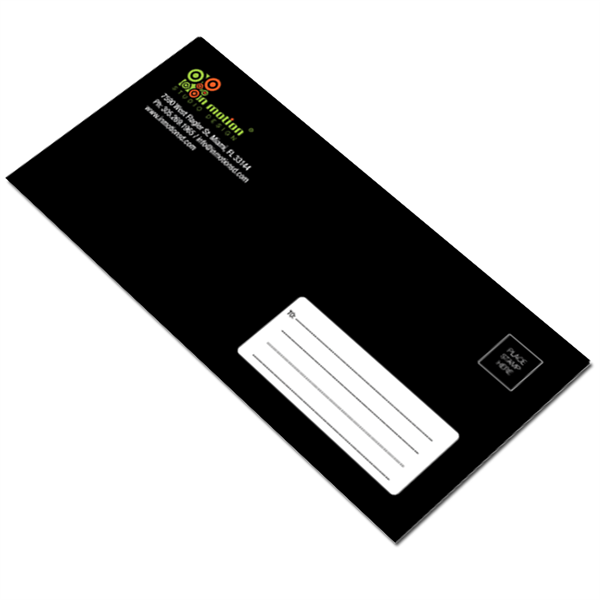 Custom printing envelopes are available from small quantities. Our envelope quality cannot be beaten. The secret is in our design team. We design many envelopes per month utilizing our professional knowledge and experiences. You will honestly be amazed by our envelope design capabilities. 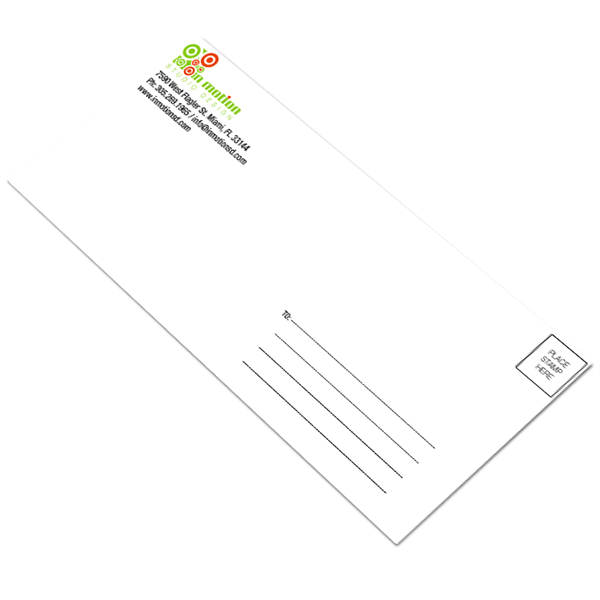 Professional Envelopes establish your brand’s image and are a great way to make a lasting first impression. Using our unique service to create custom design, Envelopes is a great way to advance your company. Our Envelopes printing service works to put the accent on your established business more formally among its networks of associates, clients, and customers to insure that you sell more products and services than ever before. Add corresponding envelopes to your order to create a concrete corporate identity. 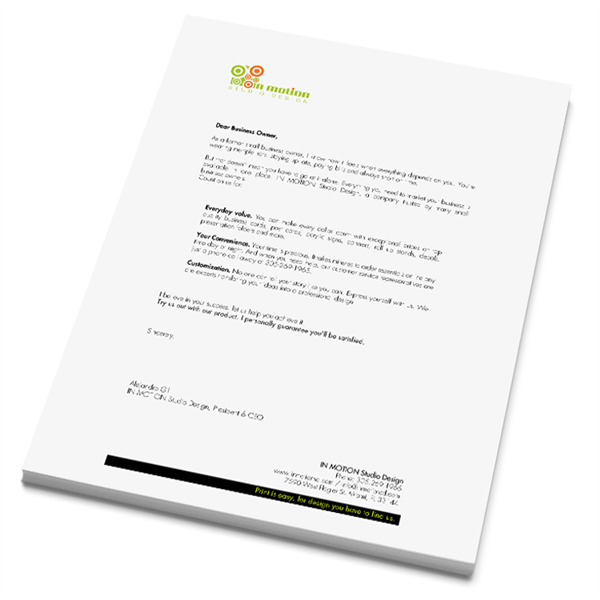 Your letterheads can be printed in full color. The sky is the limit if you go forward with IN MOTION Studio Design. Custom Envelopes printing is an exacting science and a timeless art. You need your edges cut with an expert’s eye, and your inks selected in a manner suitable the hard work you put into your business. At every phase of the process people need to pay attention to the larger goals of the project – providing you with Envelopes that reflects the quality your company demands. That’s why at IN MOTION Studio Design we give the customer Envelopes they can be proud of. Your Envelopes is your entire business image it tells the world that you are what you do and what you represent. You can’t entrust something as important as Envelopes to just anyone you need to go with the company that has the reputation, the knowledge and the dedication to deliver on your project. Go with www.inmotionsd.com. In business, Envelopes printing is of critical importance. You need to make sure your Envelopes is as refined and professional as your company is but who do you go to? Get the Envelopes of your dreams from the professionals at IN MOTION Studio Design. Our trusted, talented staff of printing experts will get you the product you need in the time frame you need, every single time. Envelopes is as integral to business as the telephone or the handshake. Your letterhead sells your entire image the last thing you’ll want is for people to not take you seriously. With IN MOTION Studio Design, you’ll never get a product of low quality or sloppy workmanship you’ll only get the best. We’ll make it right the first time, guaranteed! Go www.inmotionsd.com. Quality Envelopes printing is one of the most important goals your business can pursue. You understand better than anyone else the importance of high quality, well printed Envelopes it projects a positive image, and lets the world know you’re serious about your business. IN MOTION Studio Design understands this as well. That’s why we over-deliver on the most important business metrics: speed, price, and quality. Your Envelopes isn’t something to be taken lightly it represents your entire business strategy. Poorly printed, sloppy Envelopes tells the world that you don’t take yourself, your clients or your product seriously, you can’t afford that. Get your Envelopes done by the professionals at IN MOTION Studio Design, and you’ll agree we can’t be beat! Find us online at www.inmotionsd.com. 500 Full Color Letterheads 70 Lbs.